The start of the new calendar year has been hectic indeed. Our amazing assistant librarian is off on maternity leave, and while a former student library proctor turned library school graduate student is now interning with us, we just don’t have the same amount of help that we did before. However, we what we do have are the fabulous ideas that you all have given me over the last semester for things to do with our classes. 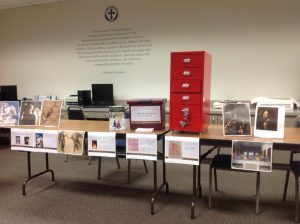 And this blog has been especially valuable to me as Christina and I have been revamping our World History classes and I have been taking on an embedded librarian project in regular US history. In particular, I thought I would talk about two suggestions that I used and how they turned out and then ask for your thoughts and suggestions. In my next post I will detail the entire six days of research that we were given for the World History project and how that went and what changes we made, but we are just at the tail end of it and we still need to finish and then take stock and do a lessons learned. Essentially, in the virtual search result, you have your class be the Google search bar and whatever phrase you write on the board, they need to enact by standing up or sitting down if they embody it. I put the words NARROW, BROADEN, AND, OR on the board and then began. “If you are a student, stand up.” Faculty sits down. At this point, we usually have a nice cheer for the one person, and I can make a comment about finding that one amazing article. I can also say a word or two about how MORE keywords lead to NARROWER search results (point to board) and that you don’t have to use just one or two keywords. More can be a good thing. Chart the keywords/search results on board (venn diagram). Then we move on to OR. For or, we did eyes. If you have green eyes, stand up. Everyone sit down. If you have brown eyes, stand up. Then, if you have green eyes OR brown eyes, stand up. HMMM. What does the room look like now. Discuss. Chart on board with Venn diagram. Then we had them move on to use their keywords with and/or and do at least three searches in the databases with and/or and bookmark sources that they found interesting. If they found a source they liked, peruse it and take a note on it. I love that we ALWAYS get salutation as an answer. Now, less IS more! And I can always say that salutations is not minimal. It isn’t concise. Hi or Yo is much better. Then, you can pair students up and have them do the next couple of lines and then present them to the class. See if they meet the 3 M’s. I find that Adele’s song is great for ease of use and ability to have two ideas in a line that is easy to identify and paraphrase. We also used Roar by Katy Perry. I didn’t think it was as successful. Perhaps with 11th or 12th graders as her concepts were a bit more advanced and she jumps in right away with them. What are your thoughts? Other songs? Right now, Christina and I are having a discussion about whether we should have rows for every sentence like you see in the document below or if we should just give them the lyrics and let them have the ability to combine lines naturally. She feels that line combination might occur more readily without the artificial boundaries imposed by the table. What are your thoughts? I would love to have a class paraphrase the whole song and then karaoke it! We quit after the first five lines. Only so much time in high school. We also used David Wee’s info on notetaking, but I am going to save that info for my longer post on our actual 6-day unit. Until then, think about what songs you would use for paraphrasing. Are you ready to stand up and do a virtual search result? Let me know how it goes. And most importantly, thank you to Katie, Allie and David and to all of you I just haven’t borrowed from yet. Don’t worry. I will soon. Because we all have something to offer! Make sure you share! Comment! Like a happy reunion with a childhood friend, re-reading a classic children’s book provides an opportunity to celebrate fond memories while also making new connections. 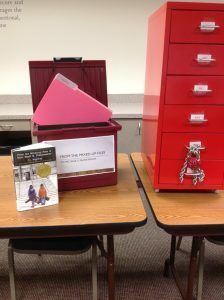 An opportunity arose to reconnect with the 1968 Newbery winner, From the Mixed-up Files of Mrs. 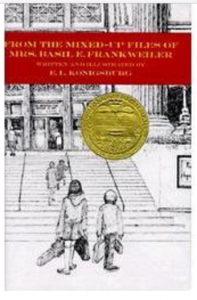 Basil E. Frankweiler, as I planned for a summer reading book discussion with a group of fifth graders. In E.L. Konigsburg’s humorous tale, two siblings, Claudia and Jamie, decide to run away from home and hide in New York’s Metropolitan Museum of Art. While there, the children discover a mystery surrounding an angel statue that could possibly be the creation of Renaissance artist Michelangelo. The museum purchased the statue for a few hundred dollars from the estate of Mrs. Basil E. Frankweiler, and a trail of clues leads the children to her home. Mrs. Basil E. Frankweiler challenges the children to solve the mystery by finding proof in her extensive file cabinets; she sets a time limit of one hour to find the correct file, while secreting herself away to observe their attempts. describing the Escape Room created at the State Library of Western Australia as well as School Library Journal’s article, “Breakout EDU Brings ‘Escape Room’ Strategy to the Classroom.” I decided to immerse the students in their own “Escape the Room” challenge: students would locate clues to solve an art mystery surrounding Michelangelo’s rival, the Renaissance genius Leonardo da Vinci. Before beginning the mystery game, the students and I read together the section describing Claudia’s and Jamie’s strategies for searching (From the Mixed-up Files, 140-146). Jamie starts frantically pulling open file drawers, but Claudia stops him, saying there is a better way. We discussed how Claudia’s approach–thinking about how information is organized and making a list of possible words for the search–are techniques used by effective library researchers. 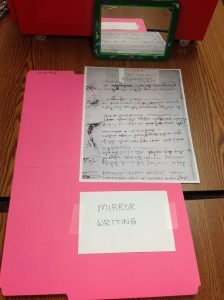 Leonardo da Vinci “mirror writing.” Students used a mirror to read reverse writing and find the combination number for the lock. Each group could only retrieve a file folder if it was labeled as matching their art masterpiece clue. (Interestingly, all three groups were frustrated by their first search attempt—students showed persistence in re-reading their clues and evaluating potential keywords). If the correct file folder was located, it provided one number, part of a combination to a lock on the file cabinet drawer. Once all three mysteries were solved, the students used their numbers to open the combination lock to find the missing Mona Lisa painting. I placed an iPad in this drawer for extra gamification. 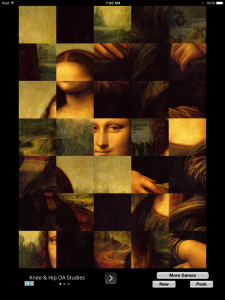 An art puzzle app on the iPad challenged students to put together the mixed-up image of the Mona Lisa. Students enthusiastically collaborated on this activity, problem-solving and trying new strategies as first attempts floundered. This GoogleDoc provides the art images and clues, if you would like to sample an “Escape the Room” adventure. Let the Games Begin!